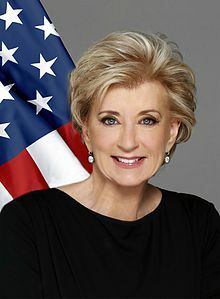 Linda Marie McMahon (née Edwards; born October 4, 1948) is an American professional wrestling magnate and politician. She is the 25th Administrator of the Small Business Administration serving from February 14, 2017 to April 12, 2019. McMahon was active with the WWE (WWF until 2002) from 1980 to 2009. She has been married to Vince McMahon since 1966. McMahon was born Linda Marie Edwards in New Bern, North Carolina, the daughter of Evelyn and Henry Edwards. She earned her Bachelor of Arts degree from East Carolina University. McMahon was active with the WWE from 1980 to 2009. During this time, the company grew from a small regional business in the North East to a large multinational corporation. As President and later CEO of the company, she created the company's civic programs, Get REAL and Smackdown Your Vote. She occasionally made on-screen appearances, most notably in a wrestling "feud" with her husband which climaxed at WrestleMania X-Seven. McMahon and her husband became wealthy through WWE's success, and the McMahon family name is now synonymous with the professional wrestling industry. In 2009, McMahon left the WWE to run as a Republican for a seat in the United States Senate from Connecticut, but lost to Democratic Party nominee Richard Blumenthal in the general election of 2010. McMahon was the Republican nominee for Connecticut's other Senate seat in the 2012 race, but lost to Democratic Representative Chris Murphy. On December 7, 2016, President-elect Donald Trump announced his intention to nominate McMahon to be the Administrator of the Small Business Administration when he takes office. McMahon was confirmed by the full Senate on February 14, 2017, with a vote of 81-19. On March 29, 2019, it was officially made public by the Trump administration that McMahon would be stepping down as the Administrator of the Small Business Administration. The resignation took effect on April 12, 2019. On April 15, 2019, McMahon was officially named Chairman of America First Action, a pro-Trump Super PAC. McMahon married Vince McMahon in 1966. Together they had two children: Shane and Stephanie. McMahon is a Roman Catholic. ↑ Hernandez, Raymond (October 5, 2009). "A Senate Candidate Accustomed to Being Thrown in the Ring". The New York Times. ↑ "WrestleMania in Connecticut". The Weekly Standard. July 19, 2010. Retrieved August 14, 2010. ↑ Dempsey, Bobbi (October 11, 2008). "Wrestling the Details". New York Times. Retrieved August 21, 2009. ↑ Drucker, Joel. ""Let the Critics Snipe; Pro Wrestling Honcho Vince McMahon Will Tell You, "We're About What People Want"". Cigar Aficionado. Retrieved January 30, 2010. ↑ "WWE says CEO resigns, names chairman as new CEO". Reuters. September 16, 2009. Retrieved September 16, 2009. ↑ Cillizza, Chris (July 26, 2010). "The Fix: For rich candidates who invest in themselves, no reliable returns". The Washington Post. ↑ Vigdor, Brian (November 3, 2010). "Blumenthal scores a knockout". GreenwichTime. Retrieved November 8, 2010. ↑ Peterson, Kristina (November 6, 2012). "Democrat Chris Murphy Wins Connecticut Senate Seat". The Wall Street journal. ↑ Pramuk, Jacob (December 7, 2016). "Trump picks wrestling magnate Linda McMahon to lead Small Business Administration". MSNBC. ↑ "Senate confirmation vote PN48". February 14, 2017. Retrieved 2017-02-14. ↑ Andrew Restuccia; Eliana Johnson; Alex Isenstadt; Daniel Lippman (Mar 29, 2019). "Linda McMahon to leave Cabinet for Trump 2020 PAC". politico. Retrieved March 29, 2019. ↑ Haynes, Danielle (Mar 29, 2019). "Linda McMahon steps down from SBA to head super PAC". United Press International. Retrieved April 13, 2019. ↑ McMahon, Linda (April 12, 2019). "Administrator Linda McMahon Farewell Video". Twitter. Retrieved April 15, 2019. ↑ First PAC, America (April 15, 2019). "Some BIG NEWS from #AmericaFirst: Welcome to the team, @Linda_McMahon! We are honored to have you as our next Chairman". Twitter. Retrieved April 15, 2019. Wikimedia Commons has media related to Linda McMahon. This page was last changed on 22 April 2019, at 07:54.